In the 1950s, Ross Renwick was one of the coolest guys on the northern beaches. He was the best surfer, cruised the coast in his blue VW, held legendary parties and was strikingly handsome. He was a larrikin lined with gentlemanly class, a rascal with private school manners and a bohemian who somewhat reluctantly became a successful businessman. Renwick was not a religious man but he worshipped the ocean. He knew its every mood, spoke its language – whether surfing, fishing or just observing it – and protected it fiercely. “If people were colours of the spectrum, Ross Renwick would be a kind of northern harebell blue,” a profile written about him in 1989 began. It was a theme that was to define his life, first as a surfer and later as a co-founder of the Billy Blue magazine and design company. William Robert Rossborough Renwick was born on August 21, 1934 to Edward Renwick, an insurance broker, and his wife, Eva. Edward died when Ross was very young and he was raised by his mother, an aunt and a cousin, Ann, in Roseville. He was educated at Sydney Grammar. Renwick began surfing in his late teens and soon earned a reputation on the northern beaches as a stylish and gifted rider. 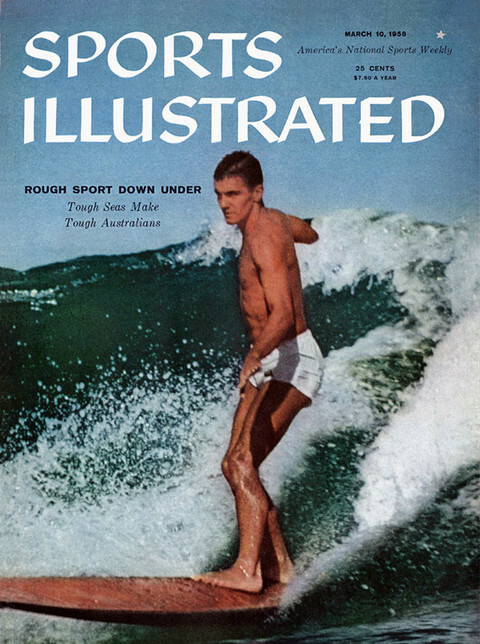 In 1958 he featured on the cover of Sports Illustrated. But his name had a currency beyond local surfers. People knew him, wanted to know him or pretended to know him. Dropping his name had clout in some social circles and an invitation to his home promised a rocking party. Windyridge, the house Renwick and some friends rented at Palm Beach, was a secluded property with spectacular views. It was the destination for 30 or 40 partygoers every weekend, first with Renwick as a tenant and later as the home of the filmmaker Peter Clifton. The young Clifton idolised Renwick and the two became lifelong friends. They would meet at the Newport Arms on Saturday afternoons with a group of friends and decide where to party that evening. Windyridge was the default choice. The Rolling Stones even visited the lively house soon after Clifton took over the lease. It was a popular haunt for some of Sydney’s young creative minds. Renwick spoke of having known Richard Neville, Martin Sharp and Brett Whiteley among others. The young surfer could charm almost anyone. He was charismatic and cheeky, with a sharp wit and a sharper intelligence. At times he could be a bit of a ratbag, yet mostly he was refined and sophisticated. He was also blessed with film-star looks: dark features, olive skin, occasionally a moustache, and a wicked smile. It was a combination that made him very popular with women and he dated a succession of beautiful women before marrying a model, Penny Pardey, in the 1960s. Pardey was spotted by Pierre Cardin and invited to work for him in Paris. Renwick followed his wife to Europe, where he made a modest living writing short stories. He travelled between London and Paris, and later told stories of having met Bob Dylan over ice-cream while staying at the same hotel. His adventures in Paris included a few hours in jail, with Clifton, for arguing with police after their girlfriends were caught jaywalking across the Champs-Elysees. Returning to Australia and separating from Pardey, Renwick entered a more steady period of his life. The 1970s brought him his two greatest successes: the Billy Blue company and his children. Renwick and his second wife, Jennifer (nee Baldwin), had two children, Daniel and Amalia. When it came to his family, Renwick was very private and protective. His daughter was the apple of his eye, and he adored both his children, who have fond memories of setting off on spontaneous driving holidays with their father. Renwick was forever generating ideas for quirky business plans and entrepreneurial ventures. He dabbled in advertising, journalism and publishing and even owned a copper fireplace business for a short time. But perhaps his greatest idea surfaced in 1977 when he and Aaron Kaplan created Billy Blue Creative. Never particularly ambitious, Renwick saw Billy Blue magazine as an avenue to promote colloquial Australian stories. In more than 100 editions, Billy Blue was a launching pad for many aspiring writers. Renwick also used the publication to sell T-shirts with provocative slogans that he had designed. Many protested against pollution and one was said to sarcastically endorse renaming the Tasman Sea the “Neville Wran memorial urinal”. Despite a loyal following, Billy Blue barely made a penny. The money was made by the design end of the business. Renwick was a gifted designer with a beautiful creative flair. In his book The Best of Billy Blue, Richard Deutch described Renwick as having “a flat-out genius for graphic design”. Renwick and Billy Blue won hundreds of national and international design awards and the company became one of the most highly regarded design firms in Sydney. An artist at heart, Renwick was uncomfortable in the business milieu and Kaplan handled most of the finance and administration. Renwick was disappointed with the standard of designers graduating from art schools and in 1989 launched a one-year diploma design course at Billy Blue’s headquarters in North Sydney. The business afforded Renwick a comfortable lifestyle. He always lived close to the sea and would head straight to the beach after work to catch the last waves of the day. He surfed into his 60s, until his knees began to fail him. He loved European cars and drove a red Jaguar in the 1980s. At other times he owned a silver Porsche replica, a number of Mercedes, a Peugeot, a Citroën and a Renault. Renwick and Jennifer separated in the early 1980s and a decade later he fell in love again, with Helen Tracey, who was quite a few years younger. The two remained partners until the late 2000s, connecting through a mutual love of nature and beauty. As a contrast from the boardroom, Renwick and Tracey spent most of their free time at the beach or in the bush, kayaking, snorkelling or just enjoying each other’s company. They also wrote successful cookbooks under the pseudonym Ziggy Zen with eccentric titles like How to Drink Wine out of Fish Heads While Cooking Lobster in a Volkswagen Hub Cap. Renwick sold Billy Blue in 2007 and, in his final years, enjoyed nothing more than sitting with his Burmese cats, reading and playing music. He was an avid reader and was known to read three novels at once. This text was sourced from the Sydney Morning Herald.